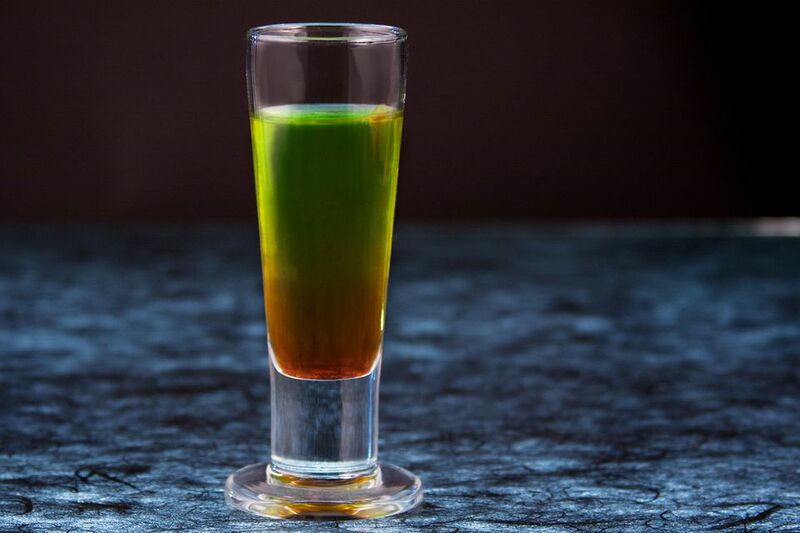 This Wolf Bite shooter is one of those fun drinks with a special effect that can make a real splash at a Halloween party. It's an interesting mix with a little surprise inside and one that guests will certainly take note of. The shooter seems all innocent and sweet. It includes melon and pineapple and the sweet taste of grenadine with a little soda sparkle. All of that is covering up a more sinister spirit. Hiding behind Midori's green color and pineapple's tropical aroma is a little absinthe. It can be unexpected, tossing that anise punch in right at the end. This is a fun one to watch your friends knock back, especially if they don't see you grab the absinthe bottle. The Wolf Bite also includes a cool visual effect. The last step in its construction is a drizzle of grenadine. This slowly sinks to the bottom and the blood red cloud against the green is quite the sight. Combine the liquors and juice cocktail shaker filled with ice. Shake vigorously and strain into a tall shot glass. Top with a splash of lemon-lime soda on top. Add a drizzle of grenadine. How Strong Is the Wolf Bite Shooter? First of all, let's point out that Lucid Absinthe is 124 proof (or 62 percent alcohol by volume). In comparison, the average vodka, tequila, and most of the base liquors are 80 proof. It is not a weak liquor! As tempting as it may be, never take a straight shot of absinthe. Instead, dilute it as it was meant to be. A night of straight absinthe shots is not a pretty thing. The absinthe in the Wolf Bite is just a 1/4-ounce pour in a 2-ounce shot. This helps bring down the shot's potency to a decent 13 percent ABV (26 proof). It will not be as strong as a straight shot of tequila and is pretty mild compared to other mixed shots. The high ratio of pineapple juice helps keep this one nice and mellow, which is surprising. The grenadine drizzle does not have to be perfect. It will act exactly as it does in a Tequila Sunrise and sink to the bottom of the glass. There's no need to try and float it because the syrup is heavier than the green liquid. A tall shot glass is essential. Most of the small shot glasses will hold just over an ounce and this recipe creates a 2-ounce shot. The tall glass will also make the visual effect more appealing. Instead of buying a large can or bottle of pineapple juice, get a pack of small cans (typically 6 ounces each). This allows you to open a single can while pouring your shots and avoids wasting a lot of juice.